DHTMLX Touch support and development was discontinued when all DHTMLX components became adaptive. We continue to add user interface components to the DHTMLX Touch library. This release adds a DataView component, which is a great solution to organize multiple objects with similar properties on a web page. You can define any custom template that will be used to display objects and arrange them according to your own design preferences. DataView is a very flexible component, which can be used to present a collection of items and display them in various layouts. Due to the rich customization capabilities, you can define how the container for each item will look like and how they will be arranged on a page. 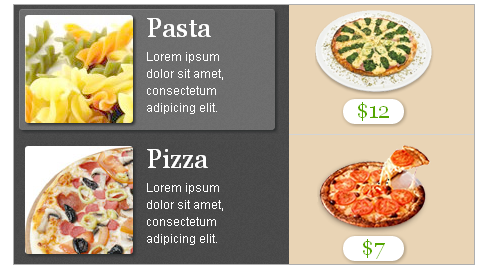 For example, the screenshot below shows a fragment of restaurant menu interface built with the DataView component. 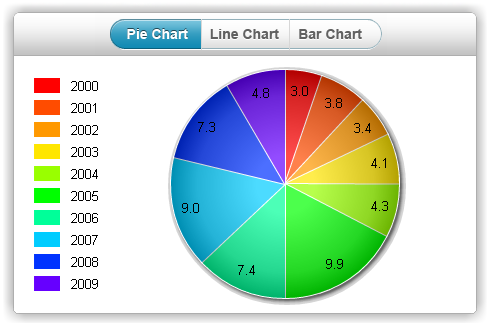 With the charts included in DHTMLX Touch, you can embed in your apps interactive charts of different types: line, spline, area, bar, and pie charts. With a flexible API, you can customize each element of chart interface (colors, text, tooltips, axes, etc.) and make them look the way you need. In addition to PHP samples of integration with the server side, the updated DHTMLX Touch package includes samples for Java and .NET. The integration works with the help of dhtmlxConnector, so some of you might be already familiar with this solution. This version has improved button element – we’ve added animation to visualize the pressed state of the button when user taps on it, and also slightly changed buttons design to make them look more stylish. Scrolling functionality has been completely reimplemented, and now it works similar to the native one. DHTMLX Touch 1.0 Release Candidate is Here! Looks great guys, im trying it out now. How much is it going to be? The framework will be delivered for free under both GPL and commercial licenses. The official support will be paid. Is there going to be drag-drop support between dataview containers, allowing items to be dragged from one container to another? We didn’t plan to add drag-n-drop support between dataview items, but might consider adding this feature in one of the next releases. Or maybe we’ll just post a tutorial about how to implement this functionality with DHTMLX Touch in our blog. I would be gratefull for a tutorial. I must say I’m eagerly awaiting the official release. Got it! Tahnks a lot again for helping me out! any plans to make your touch lib compatible with BlackBerry OS 6 (or BlackBerry Web Works) ?? Yes, we plan to add BlackBerry OS 6 compatibility in DHTMLX Touch. Can it work with Java Connector? Yes, it can. It is compatible with dhtmlxConnector (for all platforms for which it was released). Btw, java version of dhtmlxConnector v.1.0 will be released in few days.